The Termite program is our introductory hockey program for our youngest group of members. It is predominately a "Learn-to-Skate" program to get those who are beginners or have never skated to become confident at skating. It is important to note that the Termite program does not provide individual or 1:1 instruction for your player, but structured ice-time under the supervision of a USA Hockey credentialed coach. Therefore it is highly recommended that you (or another adult) become a Termite On-Ice Volunteer to assist your child while on the ice. Once they are skating, the program also offers other basic hockey skills needed to play the sport of hockey. The Termites meet once per week (based on ice availibility) from early November thru the end of March. We have a great equipment program for players ages 3 to 8! Our equipment starter kit covers your child from helmet to shin guards and comes in a nice carrying bag (excluding skates & stick). 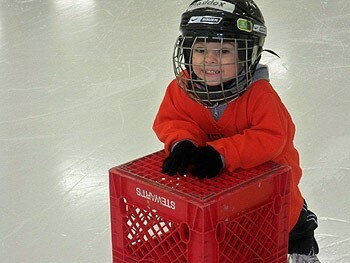 You just need to buy a new or used stick and skates to get your child started. Learn more about how to get a starter kit. Ideal for boys and girls ages 3 to 8 years old that are learning to skate. All players receive an Youth Hockey jersey and socks. The Termite I program meets approx. every Monday (times TBD, based on ice availibility) at the Glens Falls Civic Center. All players must have a USA Hockey membership to skate. Children 6 and under are registered free of charge. Adults and children 7 years or older are required to pay a $43 registration fee. Parent/Guardian volunteers are welcomed and needed both on and off the ice. Want to know more about becoming an on ice volunteer? Select the following link to read more; become a Termite On-Ice Volunteer. Parents do not have to satisfy volunteer hours.